Dyan Garris angel card oracle deck. Now, finally, with “The Integration Cards,” by Dyan Garris, oracle decks, angel cards, chakras, and integration of mind, body, and spirit, are taken to new and higher levels. This 40 card oracle deck is not only designed to help you connect with your angels, and to help bring clarity to your situation or concerns, but also—and most importantly—to help you bridge the gap of integration between mind, body, and spirit that we hear so much about but may not know how to accomplish. Achieving that integration is important because this is what helps us navigate the heretofore uncharted waters of our world that we now find ourselves in, and also because true integration of mind, body, and spirit, is a solid foundation for manifesting and creating our lives the way we desire them to be. We create our highest and best from this place of alignment. And that in turn mirrors its vibration and frequency into our daily, Earthly lives, bringing forth actual, tangible, positive change. In “The Integration Cards,” we elevate the consciousness now to include not just the seven chakras we may already be familiar with, but the chakras beyond. . .those encompassed in the eighth chakra. Here Garris uses a different kind of numbering system for the cards too, so to assist you in setting the stage for left brain/right brain, multi-dimensional integration. 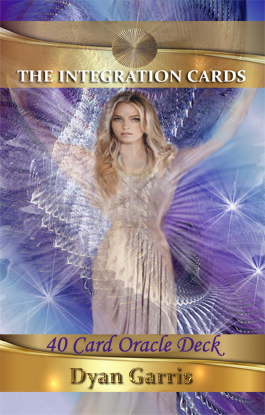 Included in the deck are eight Angels of Integration to assist you in moving forward on your integration path. “The Integration Cards” are an exciting, ground-breaking, and exploratory pathway into the shaping of your successful future. Are you ready? $26.99. BUY THE INTEGRATION CARDS NOW!